"Recently had homemade rice milk in a Mexican restaurant in San Francisco. I talked to a few friends and they told me a few different ways to make it. Here is a simple version (I like to add vanilla, but it is optional). Seriously, it is the best ever - and, it costs just pennies to make!" In a large saucepan, combine rice, water and cinnamon stick. Set aside for 3 hours. After 3 hours, bring to a boil, reduce heat, and simmer for 30 minutes. Allow to cool. The proportions are definitely off. After blending 'til smooth this was a thick rice milkshake, not a refreshing rice drink. 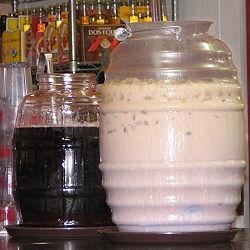 Look elsewhere for a good horchata recipie. With all due respect to the author, this did not come close to the authentic horchata my family is used to drinking. I was disappointed to find white sludge after I followed the recipe exactly. This did not turn out well at all. It looked like rice pudding after cooking, and after blending it turned into a rice shake.